After your veterinarian has examined your dog, he or she may want to begin to collect more information that will help lead to a diagnosis and then, a treatment plan. X-rays are usually a first line of imaging. The x-ray may lead to a diagnosis which allows them to move forward with a plan. However, sometimes the next step may be ultrasound to get a more thorough or specific look at a particular area of the body. Dog x-rays have been in use throughout the medical community for many decades. 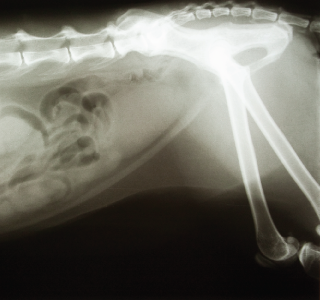 X-rays are by far the most regularly used form of diagnostic imaging in the veterinary industry because they are cost effective (comparatively speaking), and often they can accurately diagnose the state of skeletal structure and composition, large body cavities, and the presence of many foreign objects. Dog x-rays are totally painless, but some dogs can benefit from sedation to reduce anxiety and stress. Dog x-rays have traditionally been captured on actual film, however, our x-ray images are now digital which allows us to capture the images on a secure server that our veterinarians can access at any time, and can also share with specialists, if necessary. In modern scanning systems like the ones Metairie Small Animal Hospital has on-site and uses on our canine patients, the sound beam sweeps through the body many times per second. This produces a dynamic, real-time image that changes as the dog ultrasound device moves across a dog's body. We can use the results of an ultrasound to determine what is ailing your dog, and to devise the most effective treatment protocol. Common symptoms that may cause a veterinarian to use ultrasound include: vomiting, weight loss, kidney or liver disease and heart disease. A dog MRI is not used as regularly as an x-ray or ultrasound because the equipment is very expensive, very large, and requires specially trained technicians to operate. Metairie Small Animal Hospital has relationships with specialists who perform this procedure and will refer patients there as needed. Just like MRI equipment, CT scan equipment is very expensive, large and requires trained technicians to operate. Metairie Small Animal Hospital has relationships with specialists who perform this procedure and will refer patients there as needed. If you are concerned that your dog might be injured or ill, or to discuss how canine diagnostic imaging can benefit him or her, please contact us to schedule an appointment with one of our veterinarians today.